Tecno WX3 is the one of the new series in 2017 added into the W-Series family alongside the likes of WX4p, WX3 Pro and WX3 Lite. They are all lower ends in terms of specs for the price, however, WX3 Pro sports same design styling and specs as the Tecno Camon CX; which can comfortably be referred to as a budget-low end when compared to other smart Android brand likes of Xiaomi Redmi 4X, Bluboo D1 or the Lenovo Zuk Edge Z2,and Samsung. 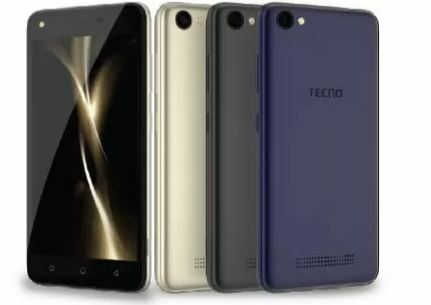 Tecno WX3 is a 5 inch device with 2G,3G network support, but no 4G. The smartphone has a plastic casing design with strings of tiny opening at the bottom of the back for the speaker. The whole design is simplistic and styled. The screen has a protection to protect against scratches and dusts. Tecno WX3 The screen user interface is run by Tecno HiOS v2.2 Android, custom Android 7 Nougat operating system. The battery capacity is 2500mAh . With Android 7.0 Nougat operating system and the simplistic design, the battery is at least say to be durable. Tecno WX3 comes with dual SIM functionality witch support for 3G network on both slot, no 4G; not surprising, yet to see a Tecno device with single SIM. Tecno WX3 is driven by 1.3GHz Dual Core CPU with MediaTek Chipset as expected. The RAM is 1GB while the inbuilt storage is 8GB ROM with expansion slot for additional storage. In aspect of camera the Tecno WX3 has 5MP camera at the rear with 5MP selfie at the front. Connectivity options include, Bluetooth 4.2, WiFi, Hotspot, 3G network, USB v.3.0. While inbuilt sensors include, Light sensors, Proximity sensors, Accelerometer, GPS. Pricing going for around 27K-30K in Nigeria market. And available in the nearest Tecno shop around your vicinity. Can also shop online via JUMIA or KONGA if you are in Nigeria. 8GB onboard storage; Expansion slot upto 32GB via microSD card.